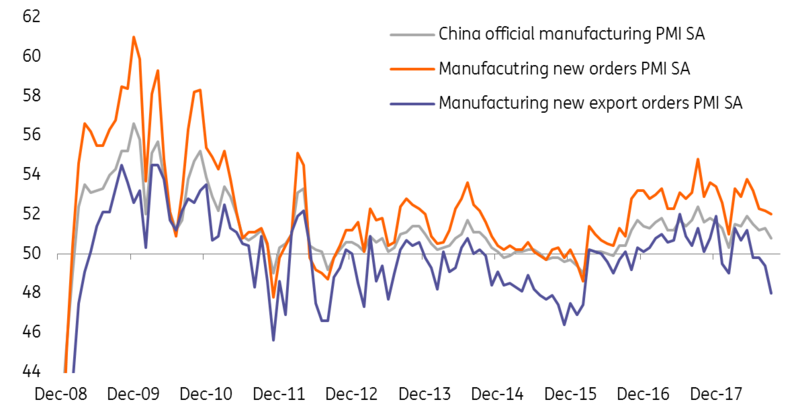 China's manufacturers have fewer export orders, which therefore affects imports. They are using inventories for delivery. This paints a picture that the export-related manufacturing sector could shrink in the coming months. In fact, the data breakdown shows that medium-sized manufacturers have suffered from the contraction of the PMI. These are all expected but the speed is still worrying. This is relatively fast as we expected that some exports would front-run tariffs imposed in September. It is quite obvious from the breakdown of PMIs that domestic orders are still rising, and this could mean that exporters are turning to sell into the domestic market. This may create a virtuous cycle but only if most of the exporters can find a domestic market for their goods. Though it is easier now than back in 2009, we still believe that not all goods are suitable for the domestic market. Some exporters could eventually close their businesses. The government is trying hard to help these exporters. For example, tariffs collected from the US have been disbursed to affected companies, and the central bank is giving out tax holidays if banks lend to small and medium-sized enterprises. Again, not all exporters could survive, even with these policies in place if they have lost their export orders to other economies that do not face US tariffs. We think that damages are unavoidable. Fiscal stimulus could do the trick, but debts would pile up and we would need to wait for the trade war to pass to clean up the debt.